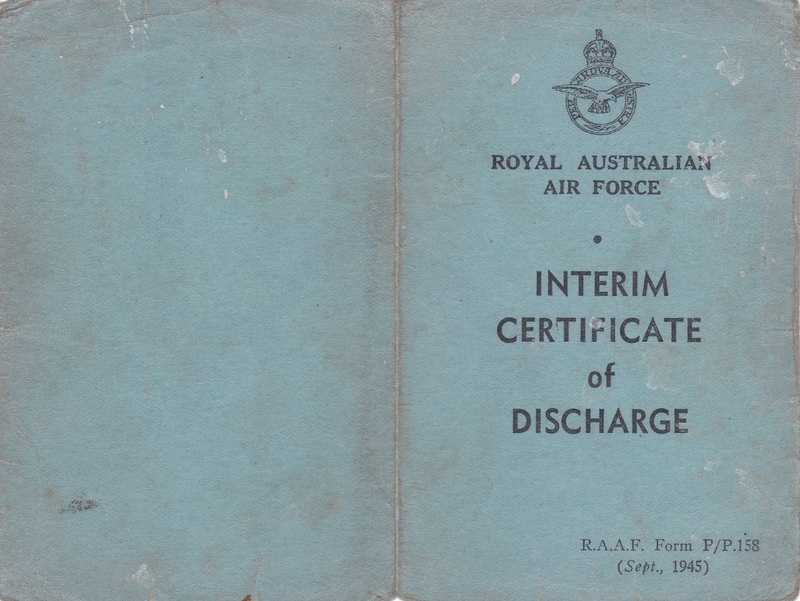 D026. 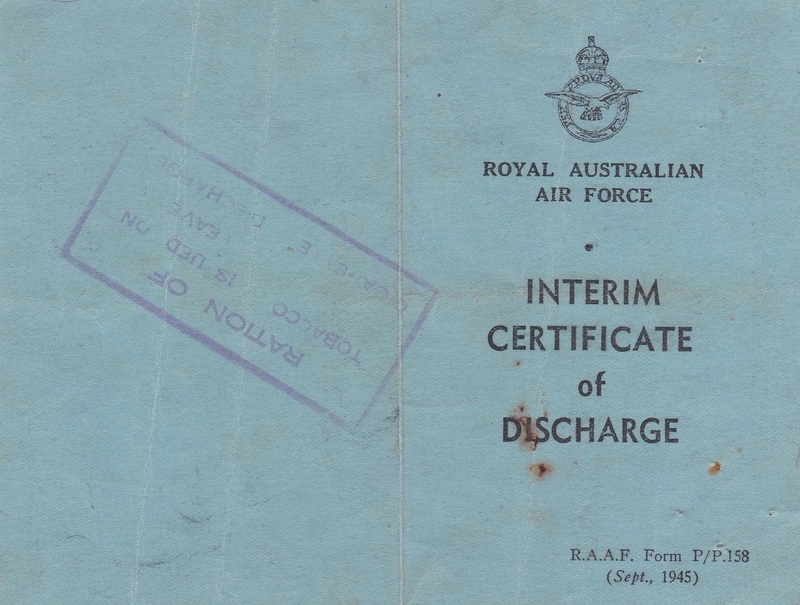 An Interim Certificate of Discharge to 130550 Shaw Leslie Arthur. 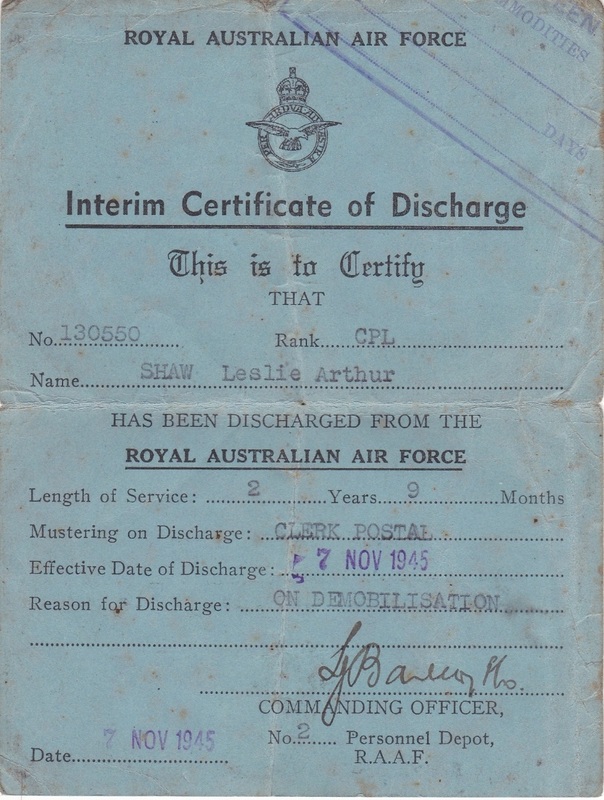 Leslie Arthur Shaw enlisted on 2 Feb 1943 at Sydney and discharged on 7 Nov 1945 from 8 PU with the rank of Corporal. D107. 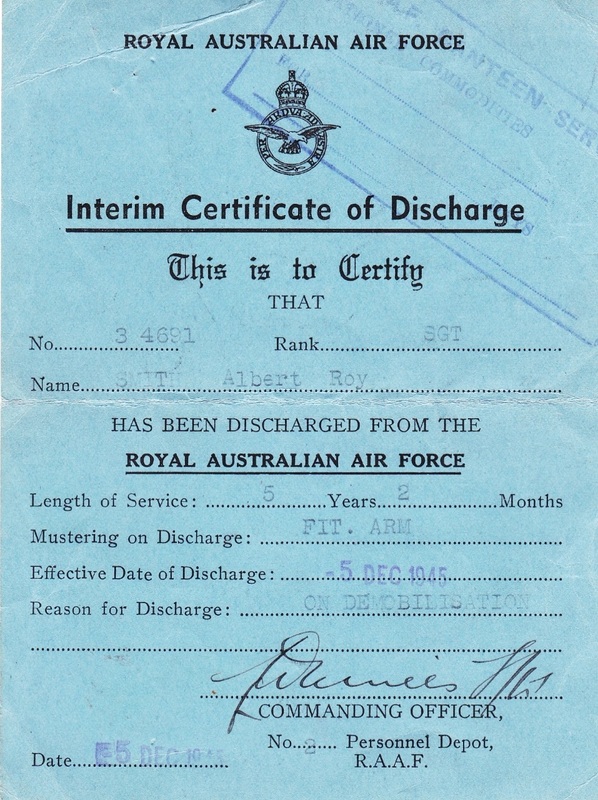 An Interim Certificate of Discharge to Smith A. R. Albert Roy Smith enlisted on 31 Oct 1940 at Sydney and discharged on 5 Dec 1945 from 5 Operational Training Unit with the rank of Sergeant. D226. 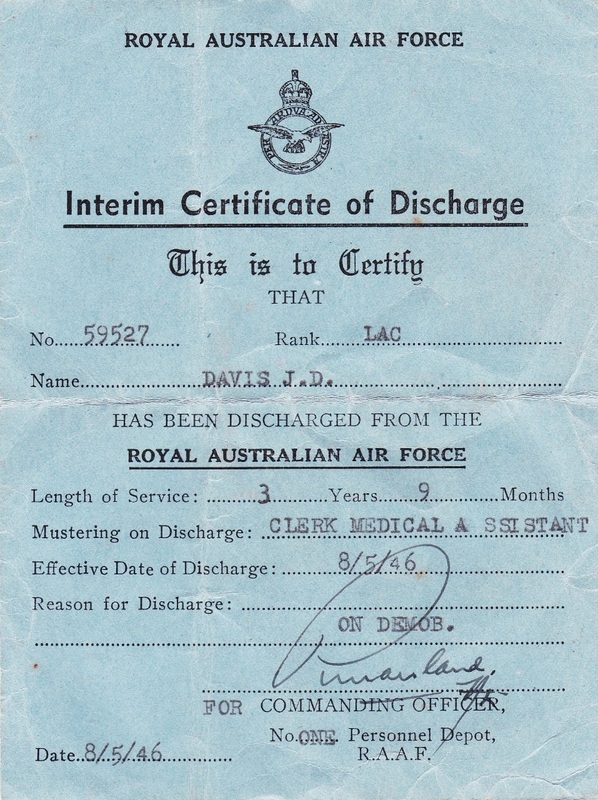 An Interim Certificate of Discharge to 59527 Davis J. D. Jack David Davis enlisted on 30 Jul 1942 at Melbourne and discharged on 8 May 1946 from Headquarters North Western Area with the rank of Leading Aircraftman. D273. 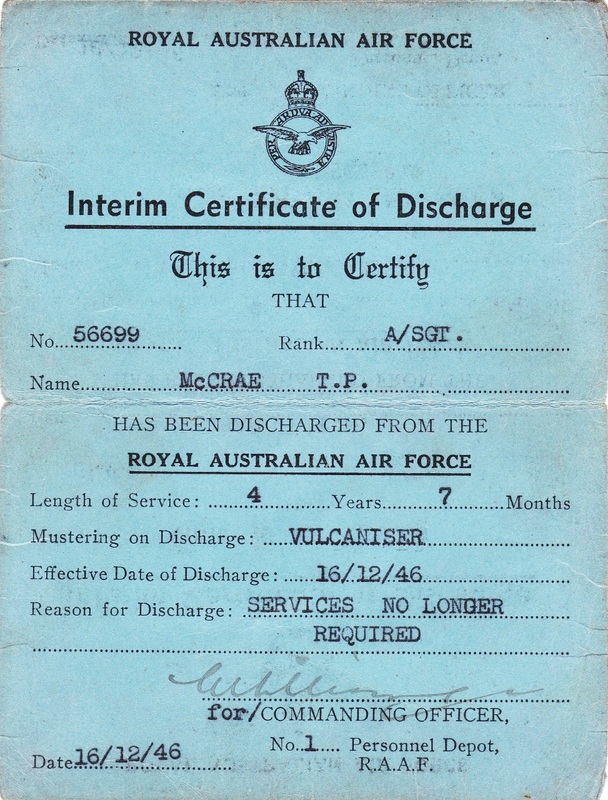 An Interim Certificate of Discharge to 56699 McCrae. 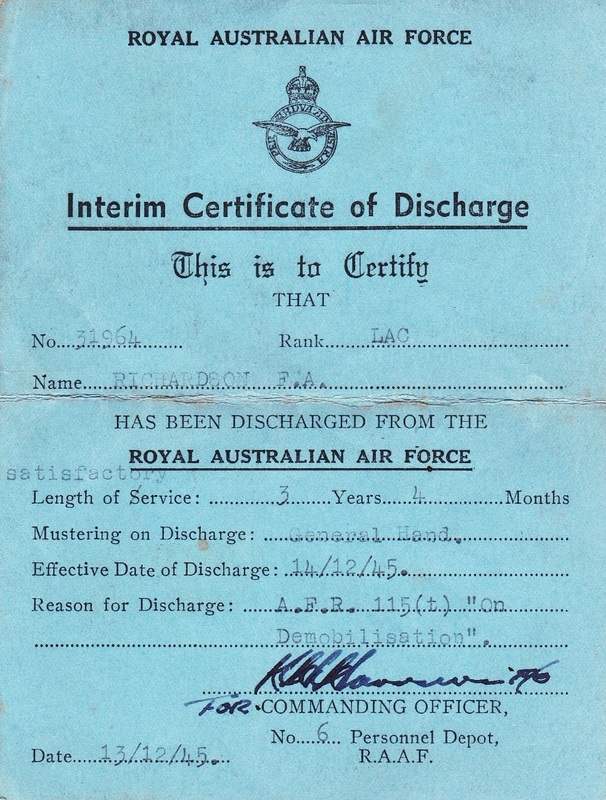 Terence Patrick McCrae enlisted on 28 May 1942 at Melbourne and discharged on 16 Dec 1946 from Laverton T & D Section with the rank of Corporal. 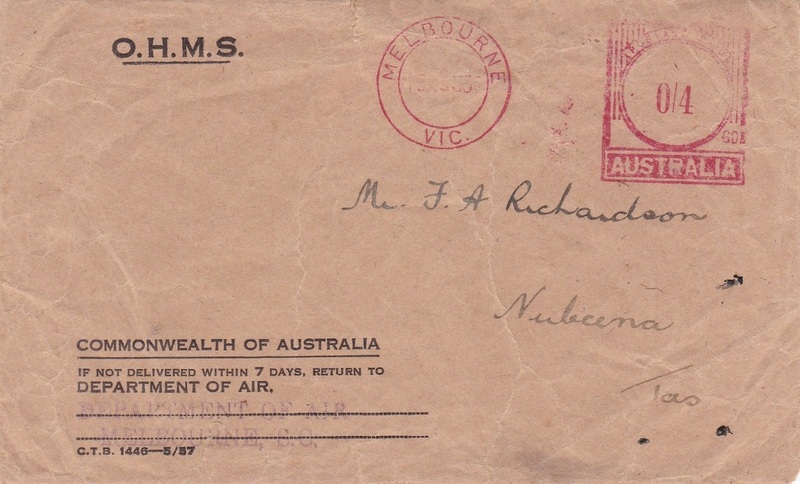 D277. 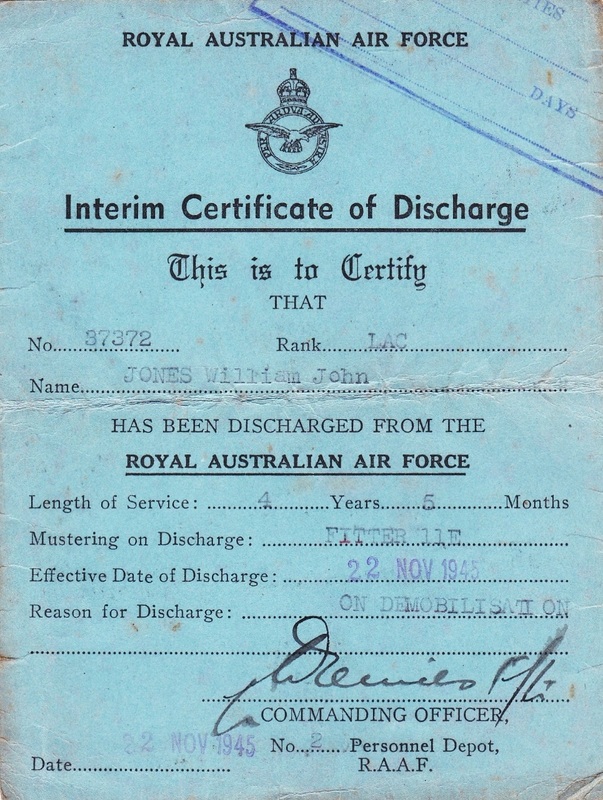 An Interim Certificate of Discharge to 37372 Jones William John. 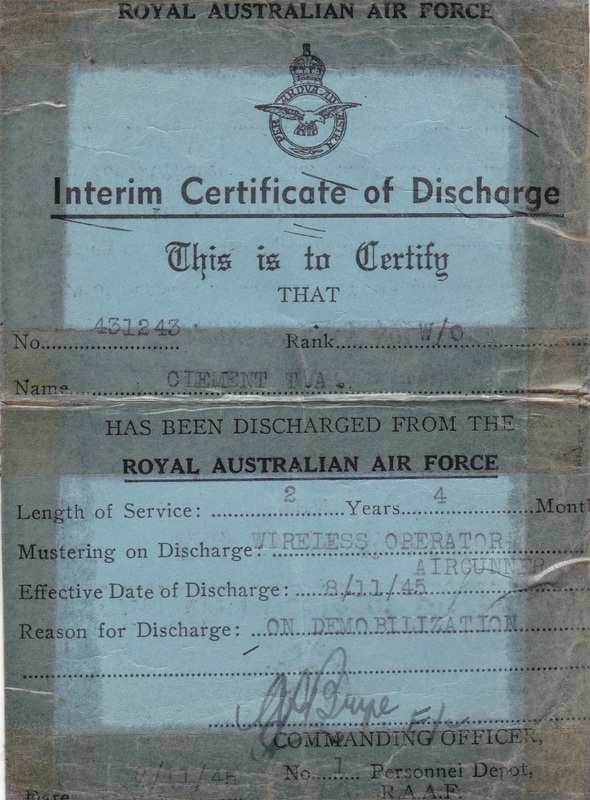 William enlisted on 17 Jun 1941 at Sydney and discharged on 22 Nov 1945 from 102 (H/B) Squadron with the rank of Leading Aircraftman. 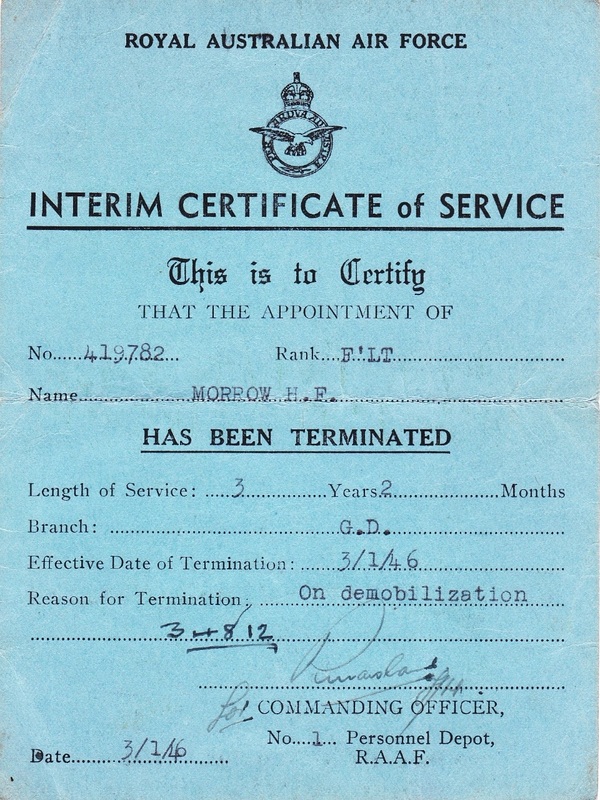 D426. 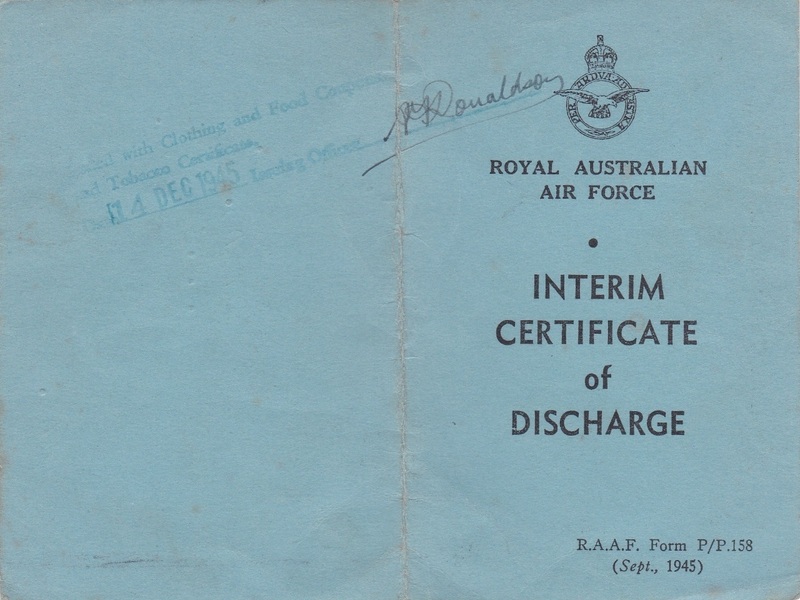 An Interim Certificate of Discharge to 31964 Richardson F. A. Frederick Arthur Richardson enlisted on 27 Jul 1942 at Hobart and discharged on 14 Dec 1945 from 4 Air Construction Squadron with the rank of Leading Aircraftman. 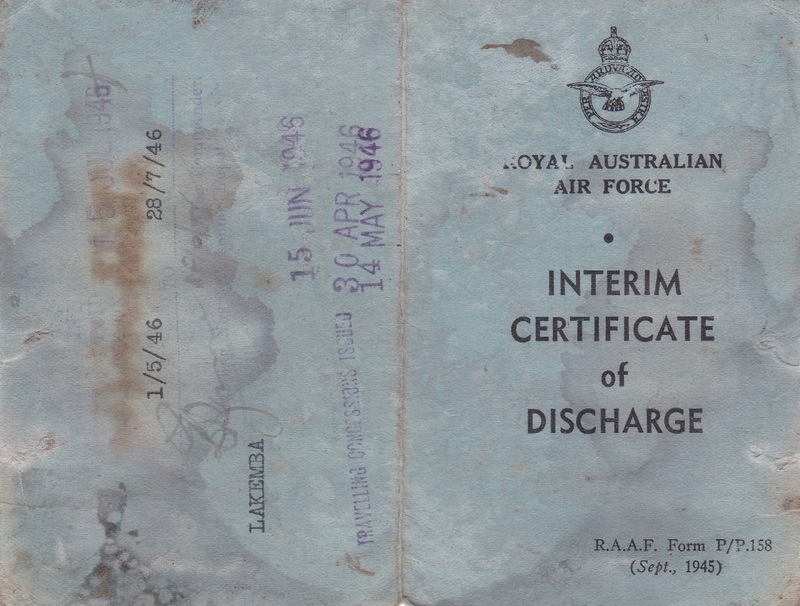 D802. 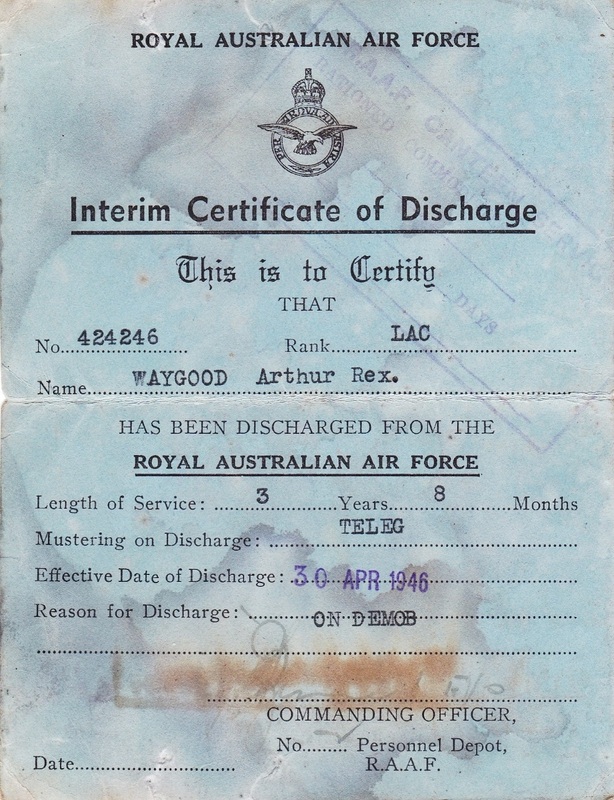 An Interim Certificate of Discharge to 424246 Waygood Arthur Rex. 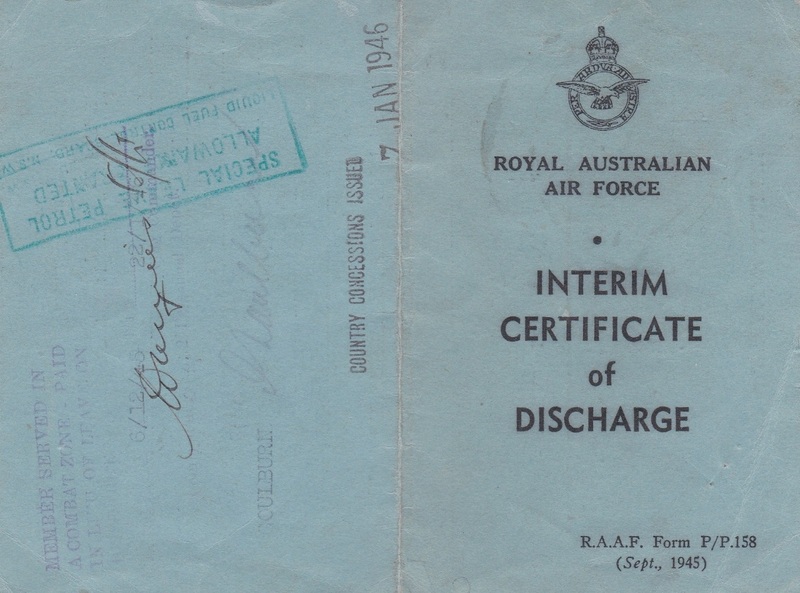 Arthur enlisted on 15 Aug 1942 at Sydney and discharged on 30 Apr 1946 from Headquarters North Area with the rank of Leading Aircraftman. 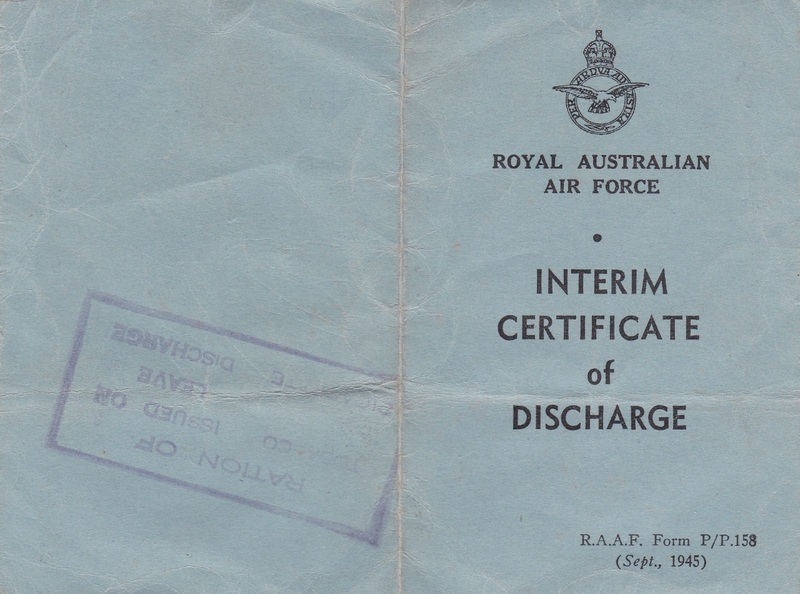 D823. 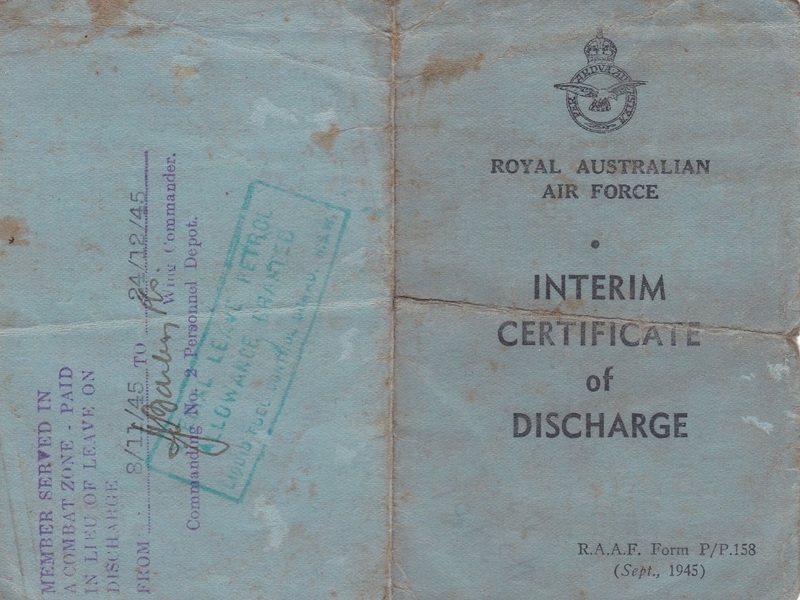 An Interim Certificate of Discharge to 431243 Clement T A. Thomas Arthur Clement enlisted on 18 Jun 1943 at Melbourne and discharged on 8 Nov 1945 from No 3 Air Observer School with the rank of Warrant Officer. 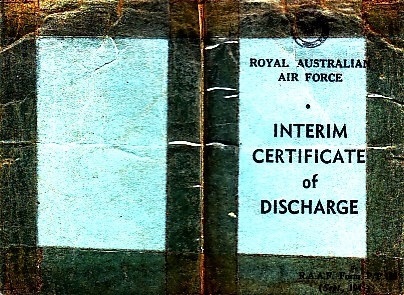 D825. 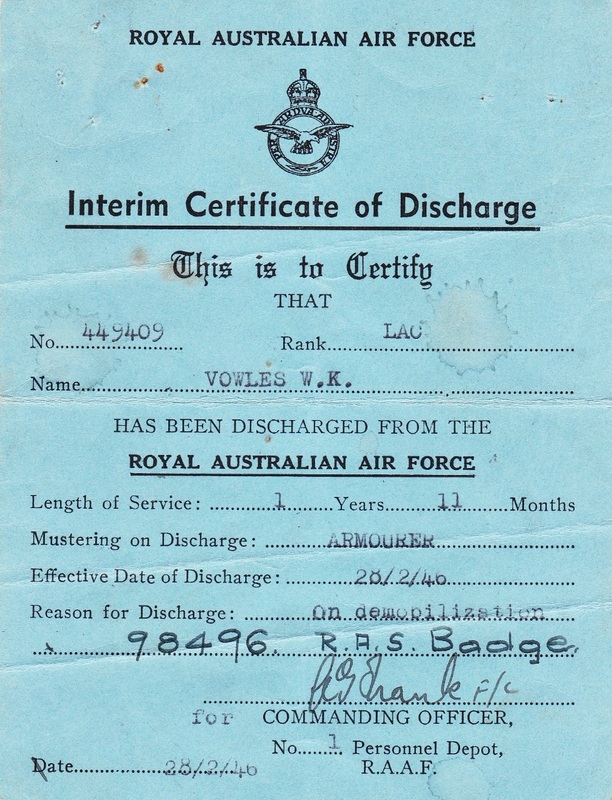 An Interim Certificate of Discharge to 449409 Vowles W K. William King Vowles enlisted on 24 Mar 1944 at Melbourne and discharged on 28 Feb 1946 from No 2 RAAF Hospital (STAFF) with the rank of Leading Aircraftman. 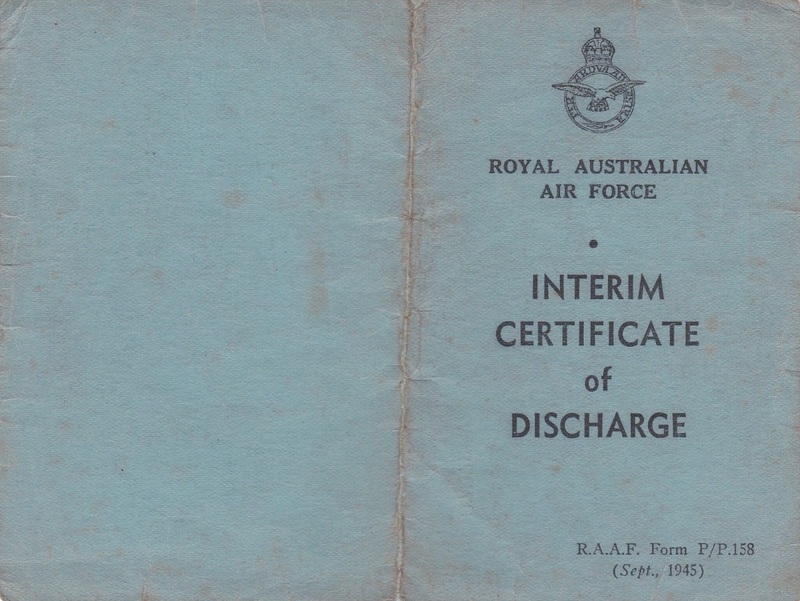 D842. 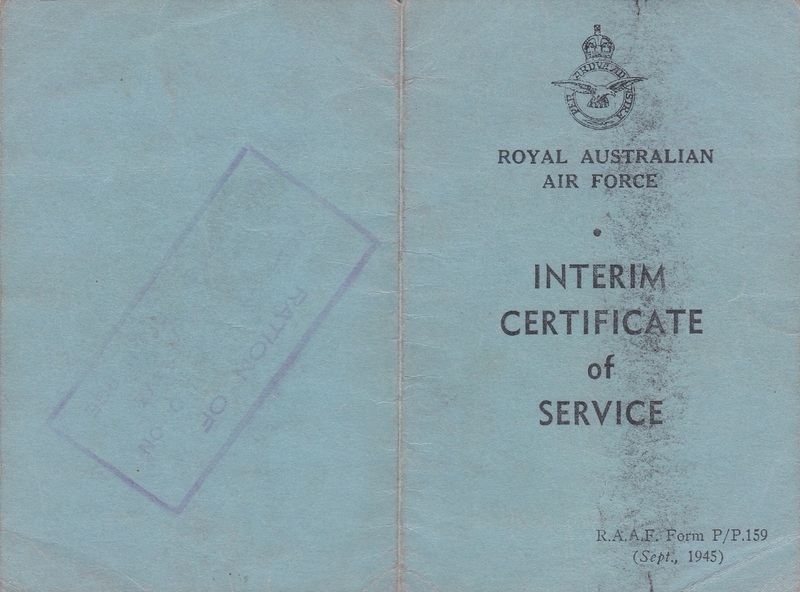 An Interim Certificate of Service to 419782 Morrow H. F. Hugh Fraser Morrow enlisted on 30 Oct 1942 at Melbourne and discharged on 3 Jan 1946 from 1 (ME) ARC with the rank of Flight Lieutenant.